Preparations are ongoing for Pope Francis’ visit to the Csíksomlyó/Șumuleu Ciuc pilgrimage site. The outdoor Hármashalom altar where the Pentecost Pilgrimage Holy Mass is held will be extended and roofed with the aim to make the altar more beautiful, practical, and spacey. Speaking with romkat.ro the abbot of the Csíksomlyó/Sumuleu Ciuc monastery, Mihály Bőjte, said the outdoor altar requires renovation, so the old stage will be removed and replaced with a new one, which is all part of the renovation plan designed by architect Ernő Bogos. The new stage will be much bigger, so it requires roofing. Alongside the renovation works, new liturgical furniture and liturgical vestments will be made for Pope Francis, according to the Holy See’s protocol. “Since we expect to see a much bigger audience at the Csíksomlyó Saddle than usual during the Pentecost Saturday, we need to adjust our sound system and build more seats for the members of the choir, the clergy, and the press, and also for our invitees,” Bőjte said. As we previously reported, Pope Francis will travel to Romania for an Apostolic Visit that will take him to the capital of the country, Bucharest, to the eastern university city of Iași, to Balázsfalva/Blaj in Transylvania, and to the Marian Shrine of Csíksomlyó/Șumuleu Ciuc on the outskirts of Csíkszereda/Miercurea Ciuc city, also in Transylvania. The visit follows exactly 20 years after Pope St. John Paul II was the first pope to visit Romania. The “Hármas halom” (“Triple hill”), after which the altar is modeled is a heraldic element that appeared in the coat of arms of Hungary in the 13th century, and while it originally symbolized the three hills of the Golgota, it has since become the symbol of the former Hungary’s three highest mountains, Mátra, Tátra and Fátra, all of which are now in Slovakia. 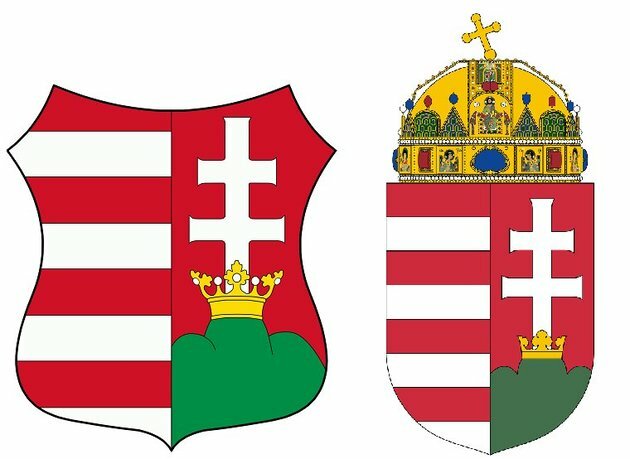 The coat of arms (without and with crown) of Hungary, with the Triple Hill.